On 12 September, Asialink Diplomacy partnered with the Australian Embassy in the Philippines to launch the Women in Leadership video series. 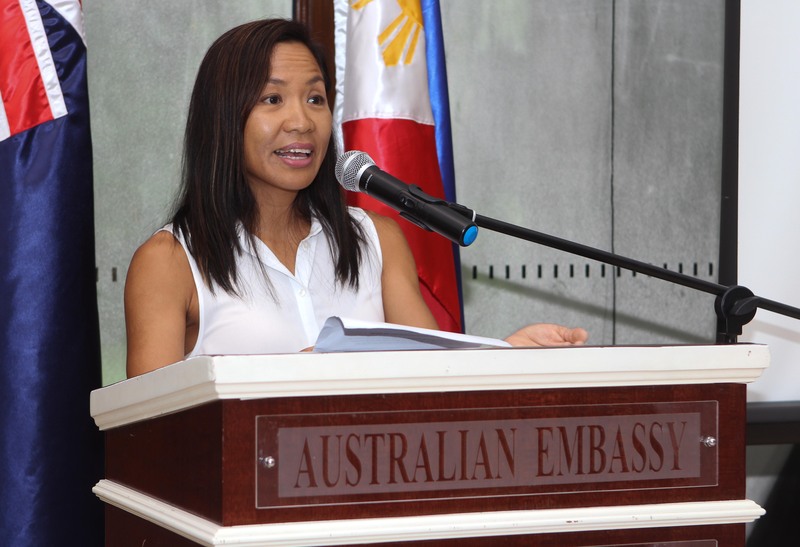 Australia’s Ambassador, Her Excellency Amanda Gorely, hosted an afternoon tea attended by leaders from the private, government, and not-for-profit sectors, as well as the Philippines’ sporting community. Guests discussed women’s representation in competitive sports with distinguished guest, and Filipino interviewee, Ani de Leon-Brown. Ani is the National Coach of the Triathlon Association of the Philippines, two-time national champion at Olympic distance triathlon, and the first Filipino to qualify for the Ironman World Championships in Hawaii. Explaining that her pioneering role in sport required the same imagination and creativity as that of her previous career as an interior designer Ani said ‘As a young female teenager in the Philippines, there really weren't any female triathlete role models I could look up to. I had to create that role for myself, even though I wasn't really certain what I was doing 90 per cent of the time, everything was trial and error’. Ani spoke fervidly about her new role as mentor to young female triathletes. Present at the afternoon tea was one of Ani’s mentees, Ms Claire Adorna, who recently won silver at the Southeast Asian Games. Ani said of her protégée, ‘Claire is just but one of the young women I am mentoring. She is already leaps and bounds better than I am, and I sincerely hope that the girls who look up to her will keep breaking barriers, levelling up their game, and creating new and better roles for themselves. The Women in Leadership video series was developed following the 2015 Asialink Conversations dialogue in Singapore. The purpose of the dialogue was to discuss opportunities and challenges for women in leadership across Australia and Southeast Asia. One of the key recommendations from this dialogue was the need to highlight role models for younger women. In consultation with stakeholders and partners across the region, Asialink identified six inspiring women to be featured in the video series. These women represent a variety of age groups and professions, and come from the Indonesia, Malaysia, Philippines, Singapore, Vietnam and Australia. The video interviews explore the barriers and obstacles they have faced and their lessons for the next generation of women. The Women in Leadership video series was supported with funding from the Australia-ASEAN Council in the Department of Foreign Affairs and Trade, and produced in consultation with ABC International. View the images from the Philippines launch of the Women in Leadership video series.